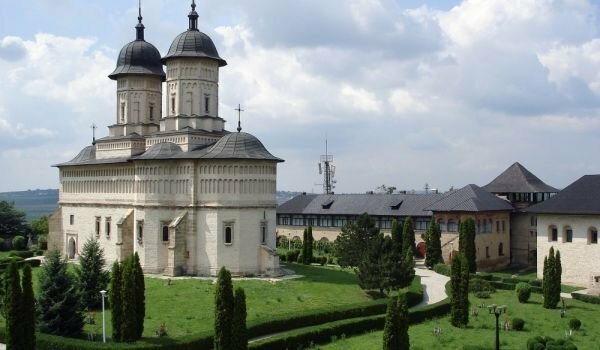 The Romanian monastery Cetatuia is an Orthodox monastery located in the city of Jassy. The monastery was originally built as a fort for protection from attacks by hostile groups. The monastery was built in 1672 by the then Romanian prince Gheorghe Duca, who was prince of Moldavia. The outer walls of the monastery are equipped with fortifications and towers in the corners. In the monastery, behind the walls, there are cells, a kitchen, an Abbey with kitchen, and cellars for wine that is made from grapes of the monastery vineyard. The monastery also has an impressive Turkish bath. The Turkish bath is square, with a hemispherical dome, on which rises a tower with eight windows. In the southern part of the monastery is situated the Gothic room, known as Lady Anastasia, which is known for its basement that allegedly led to the royal court through a tunnel. According to historical studies, that was just legend, as it's just unlikely to build a tunnel that crosses the territory of Bahlui, known as the frog pond, which is permanently flooded. From an architectural standpoint, the church of the monastery is considered to be a copy of the Church of the three hierarchies, which was built in 1639. Within the Cetatuia monastery is the tomb of Lord Gheorghe Duca, his daughter, his brother and his son. In 1682, in the monastery was situated a printer, which printed many books for the churches in the Orient. For printing to work well, monks who knew Greek well were called. They worked under the supervision of priest Mitrofan, which then became Bishop of Husi. The museum of Cetatuia monastery is a major tourist attraction, along with the tower, which is known as the Dinner of the worshiper. From there you get magnificent views of the city of Jassy. The celebration of the monastery is on June 29 - the Feast of Saints Peter and Paul. The beautiful monastery is situated near a forest hill, which bears the same name. The monastery is a work of architectural art at the time of feudalism. It is an example of the sophisticated skills of the famous Moldovan masters. The walls of the monastery were often used as a refuge for the Princes of Moldavia and helped the army to resist the Tatar invasions. The wall of the monastery is seven meters high and its width is more than one meter. It is made of solid stone. The church of the monastery, named after the Apostles Peter and Paul is the most important monument of the whole complex. Within the monastery fortress are kept bourgeoisie houses, and the house in which the princes lived is now the museum of feudal art. The paintings presented in the museum of feudal art, are of great artistic value. Among the works ar not only impressive paintings, but also small paintings, and exquisite medallions. The church architecture does not go beyond tradition - it has an altar, a corpse, portico and narthex and an apse with a semi-circular shape, each apse has three windows. There are seven pillars, which support the outer walls of the church. The porch of the church is high and has a rectangular shape. Cetatuia monastery was completely restored and renovated in the eighties of last century to continue to play its role as a spiritual oasis and to give support to anyone who needs spiritual instruction and enlightenment. Cetatuia monastery was an important historical attraction of the city of Iasi, which attracts a large influx of tourists.